The creation of the Margarita cocktail goes back to the year 1942 in a cantina (bar) in the state of Chihuahua, Mexico. It’s considered the most popular cocktail in Mexico and you can find it at any bar or restaurant where it’s offered as an aperitif. It’s usually served in a unique glass, it’s a tall-sided sombrero design glass, usually with a blue cobalt rim. This recipe is for the Classic Margarita Cocktail, with its combination of tequila, lime juice, natural syrup, and triple sec, although you can also use Cointreau, adorned with orange or lime slices. Nowadays there are endless recipes for margarita, you find it in flavors like mango, strawberry, pineapple, cherry, well endless possibilities and combinations to prepare a cocktail. But, I’m old-fashioned and like the classics. Be careful when drinking this cocktail, it is a little bit strong. 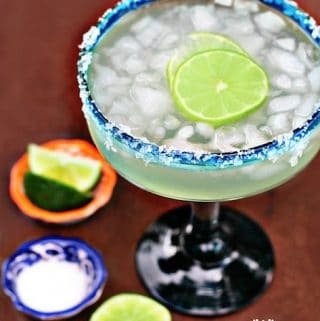 Have fun with this Mexican Margarita Recipe, and be safe! Brush the rim of a cocktail glass with lime juice. Spread out the salt in a small plate and dip the rim of the glass into it to coat. Set aside in the refrigerator. Put some ice into a cocktail shaker and add the remaining ingredients. Cover and shake vigorously until a mist forms on the outside of the shaker. Strain into the prepared cocktail glass and decorate with a slice of lime. The creation of the Margarita Recipe cocktail goes back to the year 1942 in a cantina (bar) in the state of Chihuahua, Mexico. It's considered the most popular cocktail in Mexico and you can find it at any bar or restaurant where it's offered as an aperitif. It's usually served in a unique glass. Mix sugar and water in a small saucepan and place over a medium-high heat. Stir until sugar has dissolved and the syrup has formed. About 3 minutes. Cool before using to make the cocktail. Margarita recipe original 3. Cover and shake vigorously until a mist forms on the outside of the shaker. *The recipe is from Mexico, the Cookbook. It indicates to use 1 1/2 tablespoons of syrup. I adjusted it to my own taste and to suit my homemade syrup recipe. You can buy the natural syrup at your local supermarket or make the above recipe the way I do it at home. You will have enough syrup to make 8 margaritas or reserve it to sweeten your tea or favorite drinks. If you make it, come back to tell me if you like it! It's a wonderful cookbook. I own it & use it constantly. Wow what a treat after hot day. This is surely a try. Simple yet delicious. This looks absolutely perfect Mely!! I love the classic margarita more than any other drink. Thanks so much for joining margarita week!